Hubby took a pledge to quit his sweet tooth indulgence at the beginning of the year. He decided that unless I made a dessert, he would not have any. He made me proud–he stuck with his commitment! Nearly three months into his resolution, I thought it was time to reward him (after all, if we go at this rate, he will be having sweet treats only 4 times a year ;)!). I knew that I had to make it as healthy as possible, while still satisfying his extra sweet-sweet tooth. We went grocery shopping together. When I told him what I was going to make and he watched me get the ingredients I needed, he seemed less than excited–skepticism was written all over his face. I knew I had a very challenging task and could not afford to fail. When I was done with my project and he took the first bite of my new creation, to my relief, the tension of skepticism on his face faded away. He was pleased! To tell you the truth, I think I was more excited about the outcome than he was. The dessert turned out finger-licking-good. I am excited to share it with you! The brownies are mildly sweet for sugar addicts. Those of us who eat a no-processed-sugar diet, they are pleasantly sweet. The frosting will add extra sweetness. While I would normally get almost an instant headache from sugar, this dessert left me headache free. If you feel that you need extra sweetness, add no more than additional 1/2 cup of sugar. The frosting is healthy and delicious, however, due to rich fat content of almonds it should only be an occasional treat. Cocoa and maca make this brownie recipe packed with energy. I would not recommend eating these brownies late at night, unless you need to stay up on purpose. These brownies will make a perfect energy food for the times when you need an extra kick. I used The Maca Team black gelatinized powder in this recipe (read about benefits of maca here, and my review of The Maca Team maca products here). Their black maca powder is sweet to taste and has a very mild maca aroma. I used a smaller amount of maca, since Sprout will be tasting this dessert. If you do not have kids or will be baking these brownies for an adult crowd, you can double up on maca. Scroll down to the bottom of this post to see why I picked black maca powder. Maca is the reason I dubbed this recipe as the Night Warrior (night, since the brownies are dark, and warrior, since both, maca and cocoa, will give you an extra boost of energy for the day). Using a high speed blender blend black beans and water until black beans disintegrate. You will end up with a runny mixture. (I loved using Blendtec’s Twister jar for this task). In a large mixing bowl combine wheat flour, salt, cocoa, and maca powder. Create a little indentation in the mixture and add baking soda. Take lemon juice and pour over baking soda to activate it. Add vanilla and blended bean and date mixtures and whisk together until all ingredients are well incorporated. Add chopped hazelnuts and fold into the batter. Line a 9×13 (inch) baking dish with parchment paper and pour brownie mixture into it, spreading evenly. Place in the oven and bake for 22 minutes. After 22 minutes take out and insert a toothpick in the middle and on the edges–if it comes out dry, brownies are done. If the toothpick is not fully dry, bake brownies for additional 2-3 minutes. Remove from the oven. Let cool for a couple of minutes, then gently (with parchment paper) transfer brownies onto the cooling rack. Let brownies cool until barely warm before cutting. When brownies have cooled, spread Raw Chocolate Almond Frosting over brownies, and cut into 2-3 inch diamonds. 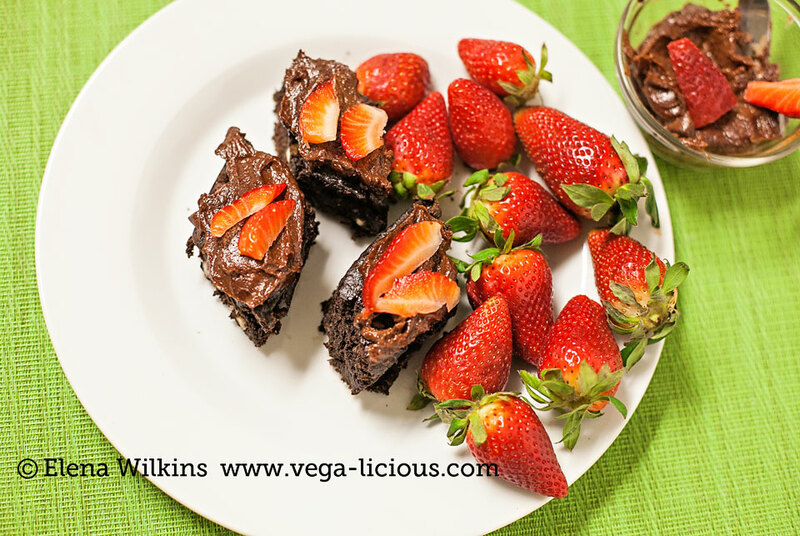 Slice strawberries into thin slices to decorate brownies. Store leftovers in a covered glass dish. *I prefer to cook my own beans. You can buy canned beans for this recipe. If you do, make sure to get unsalted option; and also make sure to rinse and strain canned beans before using in this recipe. Blend until smooth (about 40-60 seconds, or as long as needed). If using Blendtec with the Twister jar, keep moving Twister lid counter-clockwise for the duration of the cycle. If using Vitamix, keep temper moving, encouraging ingredients to stay down. You can enjoy this almond spread (frosting) as an occasional treat over brownies, or even for strawberry dipping. It makes for a decadent treat! 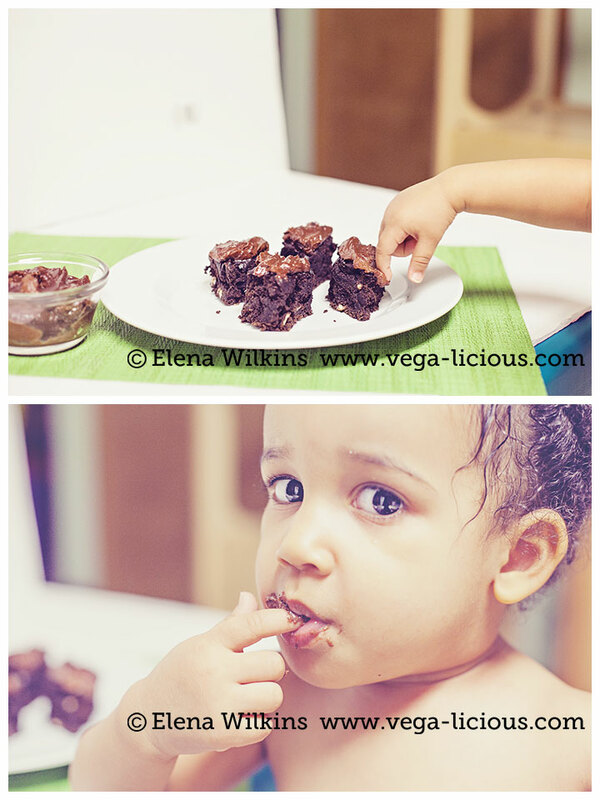 As I was setting up the shoot of the finished brownies, Sprout got done with her bath. She escaped from Hubby and made her way into the kitchen. “Mmmm… Chocowate!” she said, licking her little fingers. She loved the brownies and the almond butter. I could not let her have too much of either, since it was bed time; if I did, with all raw cocoa and maca power, none of us would get sleep all night long. Make this recipe, then come back and tell me what you thought of it. Make sure to also share it with others–pin it, twit, Facebook and email it. 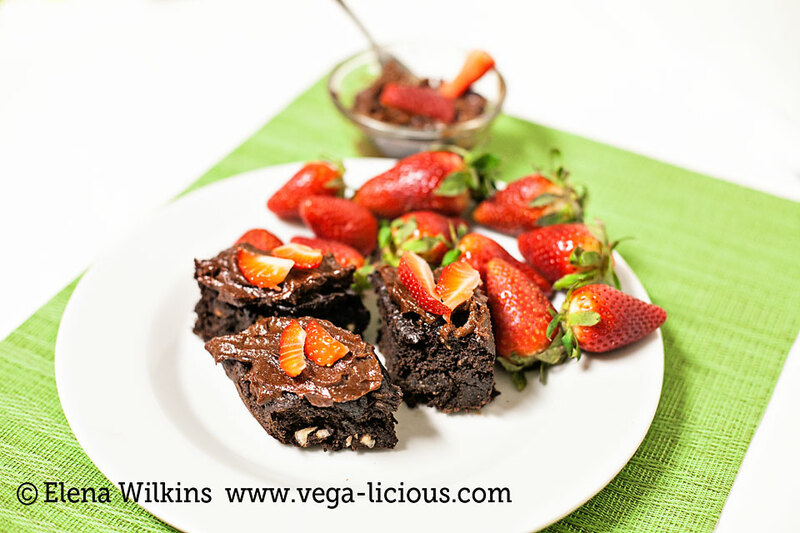 Share this healthy vegan brownie recipe with the world.